During his 30 years in IT industry Andy has done many things – he was a programmer, a Unix system administrator, a trainer, a Linux evangelist, an analyst, a project manager (and a PMP) and a regular manager, then also a ScrumMaster and founder of a young, agile software development startup. 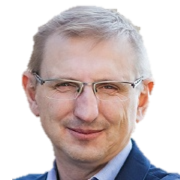 He is also Poland's most experienced Scrum trainer and first PST holding the honor of delivering first ever certified Scrum training in Polish in 2010. Currently Andy is leading Code Sprinters, the software company that evolved into Poland's largest provider of agile-related training and coaching.